This probably isn't the best way to go about doing this overclock, though I list later how to implement it better. Here I just hacked on a DIP socket and hardwired it all into place. The FPU socket clock pin 11 I pushed inwards to keep it away from the IC, though later had to place some tape over the FPU pin to isolate it from the socket better. Meanwhile, this page is to show the results of overclocking the 030 FPU. It is worth noting that the Falcon generally doesn't come with a FPU. I do have some limited stocks of them in my STORE for those who need one. The FPU used in these tests is the 68882 which is an improved version of the 68881 FPU. 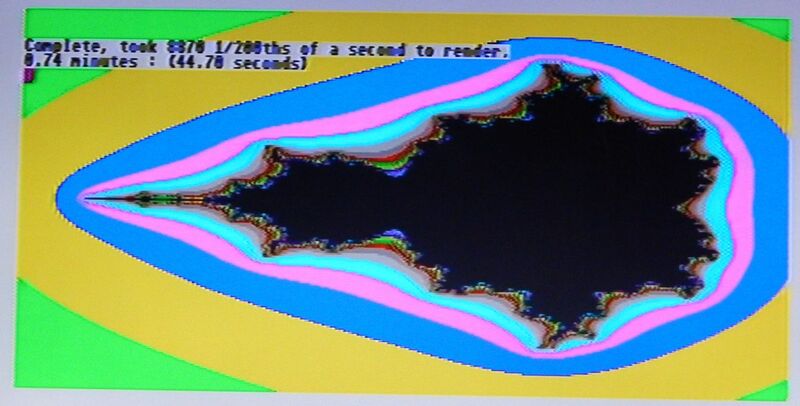 The software used was Frank B's fractal program which is HERE. Interesting that a external 16mhz osc actually runs faster than the stock 16mhz clock! Also after 50mhz not much speed gain at all. Overall it gives 32% speed boost at 50mhz-64mhz. After talking to some guys on the forum, There isn't a ideal way to do this. The best method would be to cut the socket as stated in the images below. First I thought the clock from R221 only went to the FPU, but unfortunately goes to the SDMA aswell. So the resistor can't simply be lifted to isolate the FPU clock. Clicking the images will open a larger version. First off, cut out the plastic parts of the socket highlighted in red. Next use a sharp knife and cut the corner out of the plastic as shown in the images above. Do not cut to deep otherwise you will damage the PCB or via's under the socket. Make many "light cuts" until the plastic breaks away. Then cut the track as shown in the red circle above. Make sure continuity is broken by using a multimeter and checking the socket pin to the top of R221 on the motherboard to make sure the track is broken. Here we have my little OC PCB in place. This are for sale in my STORE The PCB has 3 pins. Top pin is the oscillator input , generally 50-60MHz, then 0V and VCC. WARNING: Never run the FPU with a missing clock signal as for some reason it kills the FPU! So double check all your connections are correct before powering up.